I hope you are involved with a local group that's made a real difference in your child's life. For us, that group has been The Friendship Circle. They have a Sunday morning program Max attends during the school year, and two teen boys visit him once a week as part of a Friends at Home program. This spring, we heard about something unbelievably amazing that was happening. A girl named Olivia decided that for her bat mitzvah (a coming-of-age celebration that happens at 12), she wanted her family to give bicycles to the kids in our local program. All of them. 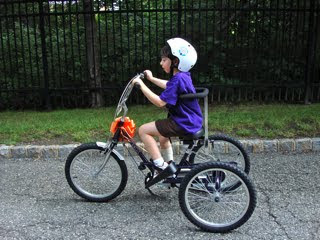 Adapted bikes. Staffers at the Circle worked hard to make it happen. I conferred with Max's therapists, looked up bikes and ultimately decided on a Triaid TMX. It looked sturdy and cool and it came in purple. We put in our order and waited. Max had no idea of the purple glorious-ness that awaited him. The scene at the event was pretty amazing. I don't think "ecstatic" or "out of his head with excitement" quite sums up Max's reaction when he first saw his bike. Max got right on and started pedaling away. Note the license plate. Sabrina wanted to help out but, really, Max didn't need it. We only later realized that the bike couldn't stop by back-pedaling; you needed to use a hand brake. That's something Max is going to have to learn. Meanwhile, we're avoiding hills! A rather awesome cake to celebrate a rather awesome birthday girl. We had to break away from the celebration because Max wanted to cruise up and down a street. "I've got wheels, Mom, outta my way!" 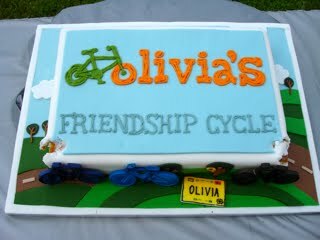 Adapted bikes are costly, and we are incredibly fortunate to have been a part of Olivia's celebration, and this program. The Triaid people have offered a 20 percent discount to any family who orders a bike through them; just mention that you read about it here. You can call 800-306-6777 or email sales@triaid.com. Thanks, Olivia, from our family to yours. We think of you every single time Max cruises around our 'hood. I don't know what is bigger - my smile or Max's! The pure joy on his face says it all! What an awesome kid Olivia is (and your Max, of course). 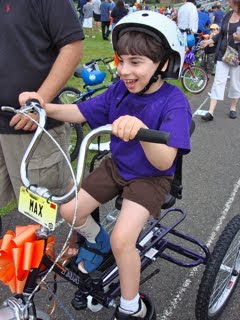 Hope Max enjoys his new bike! BEAUTIFUL! Both Max ON the purple goodness and Olivia.. ?? Amazing story! I love the bike! Lovely! A true mitzvah. Olivia should be so proud, and so should her family! Go Max, go Max go!! 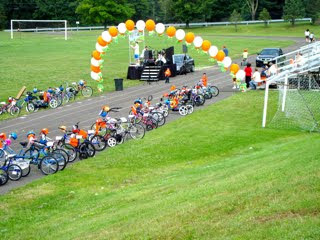 Those bikes are amazing - I worked in Camp Hasc for a week and they have tons of those bikes there. 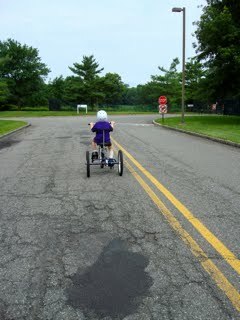 It's so amazing to see the kids who couldn't otherwise bike, zooming around the place on their adapted bikes! Hope he enjoys his new purple bike!! Sorry, gotta amend my post. I just watched the video - he looks so big and in control when he's riding the bike! If at the age of only 13 Olivia is doing such great things for others, one can onl imagine what great things she'll do in the future. What an amazing, generous and caring young woman. Yes, Olivia is an incredible young woman. And yes, I was also amazed at how quickly Max took to the bike. He looks like he'd been riding one for years, right? Danielle, you are so right! That helmet was one we got at the event, Max needs to grow into it. His usual (purple) one fully covers his head. WOW! This brought tears to my eyes on so many levels, Max's joy and the generous heart of young Olivia! 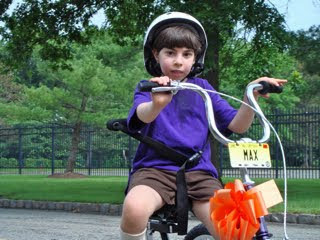 I love the purple bike and especially Max's look of happiness. 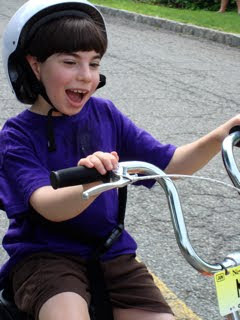 Bikes and kids are a great combination and I think that's even more true when it comes to kids who need an adaptive bike. Awesome! That is awesome! Go Olivia and go Max! Danielle is absolutely right, there should be no forehead showing. Even Max's own purple helmet in the video doesn't quite make the grade; a helmet should be perfectly level, such that "if you walk into a wall, the helmet should hit before your nose does" (see http://www.bhsi.org/fit.htm). This is important for preventing devastating brain injury because 1) the frontal lobes are where lots of our most important cognitive processes happen, and 2) we have a protective reflex to turn in the direction of a fall, which, if we fail to break the fall with our hands, can result in a direct smash to the face and forehead. To be realistic, Max is riding a stable 3-wheeler with side seat-guards, so he's probably even less likely to have a head-to-sidewalk collision than if he were just walking around. However, you are a wonderful advocate and word-spreader, and surely brain injury is a topic near to your heart. Maybe you can raise a few consciousnesses. I see most kids and many adults with bike helmets pushed far back on their heads like Huckleberry Finn's straw hat, making them useless against most falls. It may feel weird to wear a helmet straight across your head with the straps completely vertical on your temples, and you may think it looks dorky (or cool, if you like the Tour-de-France look), but that's what's necessary to make the helmet an effective safety device rather than a sporty fashion accessory. Aside from all that, congrats on the bike! What a great thing! I love Max's smile. What a great Bat Mitzvah project. I am going to share the story with our synagogue's 7th graders to show them how big of a difference they can make. I also wanted to let people know that Freedom Concept is also giving away bikes or at least discounts in bikes. I don't know much about these bikes, but if you are interested you could explore more. Here is the information. That is UNBELIEVABLE! Those bikes are sooooo expensive. We want to get one for Ben but they cost thousands of dollars. What an amazing gift! Yippee! What a wonderful young lady Olivia is! Inspirational! There was something so peaceful to me while watcing that video. Man, he's got it down and he's cruising as calmly as a Sunday drive. Awesome!! I find that video very peaceful, too. Do you like the piped in bird sounds I added? Ha, ha. Anon, thank you for your helmet insights. I will get Max over to the bicycle shop and look for a more fitted kind. It's tricky, because his head is very small. Louise, I'm going to email you about getting Ben a bike. 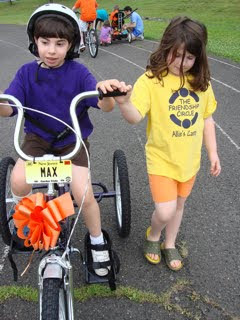 We got an amazing bike for my sister from Olivia's Friendship Cycle program as well. There is just something so cool about watching her pedal (or so far, get pedaled) in it...and she has definitely mastered the steering part. What an incredible gift! Can't wait till my bird can ride a bike someday! What a gorgeous selfless child, and as someone else mentioned, a true mitzvah. This brought tears to my eyes, I am only 34, but it always makes me so happy when I see younger kids thinking of others when there is so much not awesomeness in the world.